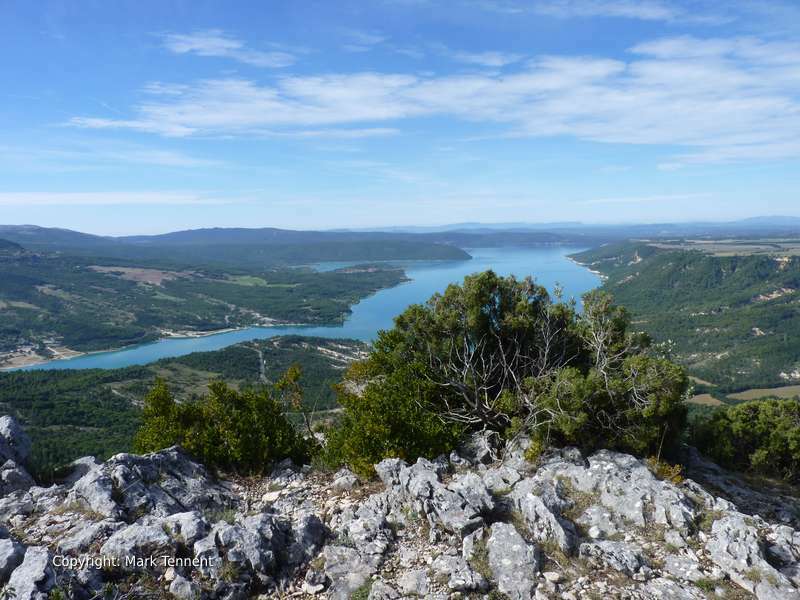 Discover Provence and the gorges of the Verdon in the Haute Provence. Walking and also time to relax and discover this beautiful corner of France. Our base for this holiday is Moustiers Sainte-Marie in the Haute Provence, voted one of the most beautiful villages in France. The village is close to the spectacular Verdon Gorge, the lavender fields of the Valensole plateau and the Lac de Sainte-Croix. Moustiers is set at the foot of a steep rocky cliffs a juxtaposition of water, stone and pastel colours. Moustiers is famous for its ceramics (or pottery). High above the village, suspended on a 135 metre long chain between the cliffs, is a star put in place after the Crusades. Moustiers is also known for it’s olive oil with over 20,000 olive trees growing on dry stone terraces. The Verdon Gorges are one of most dramatic sights in Europe; a mini Grand Canyon. The gorge is up to 700m deep with the river Verdon running between the impressive cliffs. The cliffs are home to vultures and it is also a mecca for rock climbers. Nearby too, is the Valensole plateau is one of the most areas for the production of lavender. The Romans used is to perfume their baths and clothes. It was introduced to France by the Phoenicians and the climate and ground in Provence was found to be ideal for growing it. The lavender is in bloom from the beginning of June to the end of July. The following is a summary of the tour informaiton. For further details please contact me. D1 – Arrival at Marseille airport and transfer to Moustiers. D6 – Le Sentier des Pecheurs. The Sentier des Pecheurs or the Fishermen’s Path descends to the edge of the Verdon gorge passing through the typical vegetation of the region. The walk gives superb views of the gorge and its cliffs. The path leads down to the edge of the river where the effect of the Sainte-Croix dam means that the river is calm here. The path now follows the river for about 2 km. We now begin the ascent by a series of switch-backs and finishes on a grassy plateau. Walking time: 3 hrs. D8 – Transfer to Marseille airport after breakfast. Hotel accommodation for 7 nights.